Nokomis – our grandmothers – walk to protect our water, and to protect all of us. 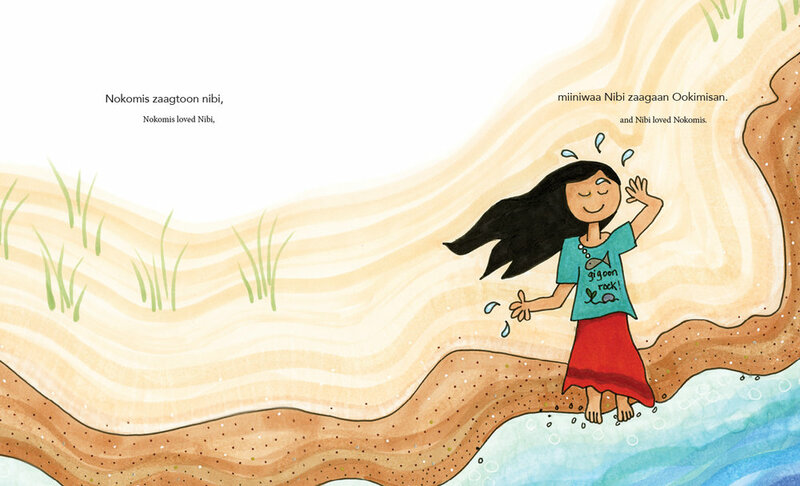 The dual language edition, in Anishinaabemowin (Ojibwe) and English, of the award-winning story of a determined Ojibwe Nokomis (Grandmother) Josephine-ba Mandamin and her great love for Nibi (water). Nokomis walked to raise awareness of our need to protect Nibi for future generations, and for all life on the planet. She, along with other women, men, and youth, have walked around all the Great Lakes from the four salt waters, or oceans, to Lake Superior. The walks are full of challenges, and by her example Josephine-ba invites us all to take up our responsibility to protect our water, the giver of life, and to protect our planet for all generations. Colouring Pages for The Water Walker! Click on the buttons to download a colouring page activity. If you would like to let Nokomis Josephine know how you are protecting the water, mail your drawing and a letter to her — her address is on the colouring pages! Joanne Robertson is AnishinaabeKwe and a member of Atikameksheng Anishnawbek. She continues to help water walkers through live GPS spotting to make sure the water is safe on their journeys. Joanne lives near Sault Ste. Marie, Ontario.